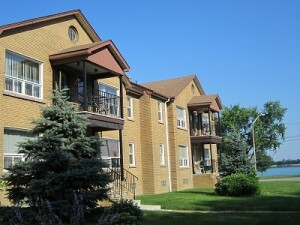 In 2003, through the Canada-Ontario Affordable Housing Program, a twelve (12) unit apartment building was purchased in Windsor, Ontario to create Labour Community Gardens. LCG is a non-profit housing development that offers affordable housing with reduced market rents for eligible applicants. Labour Community Gardens offers spacious one (1) bedroom units, with two (2) appliances, a private balcony and laundry facilities on the premises. A great added feature of this apartment complex is the on-site Community Centre available to all residents for hosting gatherings with family and friends. Situated on the corner of Strabane and Riverside Drive, Labour Community Gardens is just steps away from beautiful gardens, fountains and walkways along the riverfront, offering great views of the Detroit River from your own balcony. Contact us for more information. Pets are allowed in accordance with Residential Tenancies Act and City of Windsor by-law. Located near the intersection of Riverside Drive and Strabane. See Google maps for directions from your location.